This short review in the Boston Globe is an indicator of the growing trend of circus as a contemporary art discipline being invited in to surprising spaces, often to collaborate in interesting, multi-disciplinary ways. Although this show was clearly a straight-forward juggling show, the approach the creators took in applying dramaturgy and contemporary tempo to it elevated it to a production that was invited to perform almost more as performance art in a museum setting. Back in February 2017 at the Institute of Contemporary Art, Italian visual artist and choreographer Alessandro Sciarroni seemed to stop time with the Bavarian Schuhplattler dancing of his “FOLK-S_will you still love me tomorrow?” The show he’s brought to the ICA this weekend does just the opposite. “UNTITLED_I will be there when you die” (subtitle courtesy of the My Morning Jacket song) deploys four professional jugglers in a perpetual-motion meditation where time never stops, and neither do the performers. 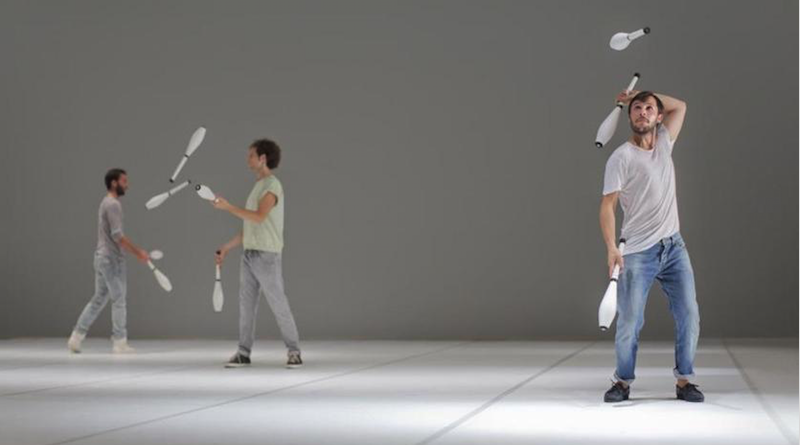 “UNTITLED” begins with the four jugglers — Lorenzo Crivellari, Edoardo Demontis, Victor Garmendia Torija, and Pietro Selva Bonino — taking the stage in silence, all dressed in T-shirts, pants, and sneakers, each with one club in hand. They stand motionless for a few minutes. Then, one by one, they start: throw with the right, catch with the left, throw with the left, catch with the right. The throwing isn’t synched, but the plopping sound you hear each time someone catches a club creates a kind of clockwork tick-tock.